On April 29, 2013, China’s biggest e-commerce firm Alibaba Group announced that it would acquire an 18 percent stake in Sina Weibo for US$ 586 million, a deal that could reshape the country’s Internet landscape. Sina Weibo is China’s most popular Twitter-like microblogging platform with over 500 million user accounts, but it has yet to find a profitable business model. By connecting the millions of Weibo users to Alibaba, an e-commerce platform that handled more transactions than Amazon and eBay combined last year, the deal is widely heralded as a game changer that could jump-start an era of social commerce, or social media driven e-commerce, in China. As connectivity spreads, Internet service and mobile devices offer vital outlets for individuals to transcend their current environment, connecting them with information, jobs, resources, entertainment and other people. Excluding oppressed populations from participating in the virtual world would be a very drastic and damaging policy […]. As banking, salaries and payment transactions move increasingly onto online platforms, exclusion from the Internet will severely curtail people’s economic prospects. It would be far more difficult to access one’s money, to pay by credit card or get a loan. As a country facing the Internet “dictator’s dilemma,” the above scheme presents great potential for China to bring the Internet’s convenience to bear upon curtailing of online freedom. By embracing the Internet, the Chinese government has reaped its benefits for economic and social developments, thereby enhancing its legitimacy. According to McKinsey, a global management consulting firm, China is the second largest e-tailing market in the world, after the United States, with sales totaling US$ 120 billion in 2011. But at the same time, the Internet has become a vibrant public sphere filled with criticisms about government policies and corruption. The well-known Great Firewall, which blocks “undesirable” foreign websites, and elaborate social media censorship, with forced cooperation from private Internet companies, are the official responses. A recent Economist special report described the Chinese Internet, with its distinct mix of economic freedom and political “unfreedom”, as a flourishing “giant cage” which is constantly watched over. The Alibaba deal is about strengthening mobile positioning and spurring social commerce. The government would probably be pleased to see Weibo shift from being a hotbed of social and political commentary and critiques to more of an online shopping arcade that, through integrated online payment functionality, has the voluntary real name registrations of many users. 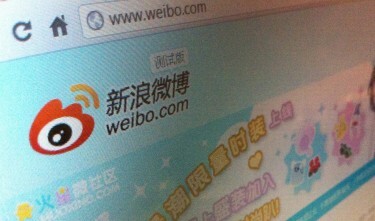 Sina Weibo, China's biggest microblogging service. By jonrussell CC: BY-SA. In December 2011, the Beijing Municipal Government issued rules requiring microblogging services to verify the identity of their users. In December 2012, China’s legislature, the National People’s Congress, passed a law requiring users to provide their real names when registering with an Internet service provider. While the rules have thus far not been well implemented, China’s leadership sees this as a top priority. In late March 2013, the State Council released its task list for the next five years, which includes implementation of an Internet real name registration system by June 2014. When so much is at stake, the threat of being excluded from the Internet will have a powerful chilling effect. Self-censorship will be heightened to a whole new level for concerns of being excluded from commerce, finance and social security. In the Internet age, the greatest long-term threat to a genuinely citizen-centric society — a world in which technology and government serve citizens instead of the other way around — looks less like Orwell's 1984, and more like Aldous Huxley's Brave New World: a world in which our desire for security, entertainment, and material comfort is manipulated to the point that we all voluntarily and eagerly submit to subjugation. If we are to avoid this dystopian fate, political innovation will have to catch up with technological innovation.